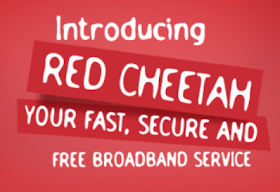 Society for Worldwide Interbank Financial Telecommunication (SWIFT) has launched a free browsing service called "Red Cheetah Free Wifi" in Lagos State, Nigeria. In this post, you will discover all the information about this Red Cheetah free WiFi service by SWIFT and how to enjoy it yourself. Remember, SWIFT is a popular 4G network provider in Nigeria which currently covers some states in Nigeria such as Lagos, Ibadan, Abuja and Port-Harcourt. But this free wifi service is currently available in Lagos alone but could extend to other cities and states as time goes on. If you notice, some guys employed to create awareness and help Nigerians activate the service can be seen in BRT bordering terminal, Ketu, Ikrorodu and other routes. Their duty is to enlighten the public of what Red Cheetah Free wifi was about. Whenever these guys enters a bus or an environment, they usually make the SWIFT Wifi open to everyone, so that you can download the app inside the bus. After downloading, you will be told some of the available features requrd to enjoy this WiFi. Meanwhile, whether you encounter the Swift guys or not, I will guide you on the processes and procedures to be ready for this offer. First, let's take a look at the features of what we are talking about. While the service is free of charge, there are certain drawbacks or disadvantages such as the pop up of video ads while browsing which you must allow to play for at least 30 seconds or else your wifi will be disconnected. Red Cht is currently available in about 500 locations (500 buses, 50 restaurant and 2 malls). According to the company, it will be available in 10,000 locations within Lagos state. Lagos was chosen as a branch test locations and with time it will be extended to other states. First, you need to the download Red Cheetah app from Google Playstore by clicking here and register. After that, for you to access the offer, you need to be in cities or location where the service is available. The app is currently available for Android platforms but the Windows and iOS version of the app will be available within 3 months. How to use the SWIFT Red Cheetah Free WiFi App? First launch the Red Cheetah Application and register just one-time registration using your full name, phone number, email address, gender and age range. Next, select on the “Go” button to get access to the free broadband service whilst you enjoy periodic advertisements from different sponsors during your browsing sessions. This is the only way you say thank you to SWIFT. 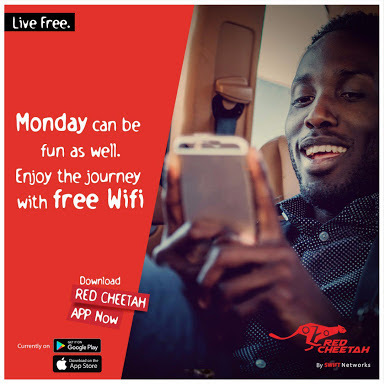 Once you have the red cheetah App, you will be notified on your phone anytime you enter any area where the Free Fifi is available. NOTE: For now, the wifi access is not unlimited as each device has a data cap of 1GB. This means once you have used up to 1GB of data, your connection will be terminated for that device unless you register with another device. However, the company hinted that soon, it will be an unlimited offer but for now, it's data capped.